23 offers found, up to 22% less expensive than the average. Entryway windows can make or break to your guests' first impressions of your home. With the right entryway windows, you can keep the entrance to your home bright, stylish, and comfortable. Because every home is different, there are endless combinations available for entryway windows. Entryway windows are also a great opportunity to further enhance your front door's design. Windows on either side can allow more light into your entryway, making your front door sparkle and stand out. Read on to learn more about the best entryway windows for your home. When looking for your ideal entryway windows, it’s important to determine how well-lit you’d like the entrance of your home to be. Transoms, a window or window set above your front door, are a great way to elongate your front door's appearance and add additional sunlight. Because they are generally located high on the wall, transoms also won't compromise too much of your privacy. There are plenty of different sizes and shapes available for transoms, which means that you can choose how much light you’d like coming from your entryway windows. Sidelights, windows on either side of your front door, can also enhance your front door's appearance. For these, try long fixed windows that match the length of your door, in order to make your front door appear much larger than it is. More entryway windows can often lead to more heat escaping from your home or to higher air conditioning bills. With the right glass or glazing, however, homeowners can manage their entryway's temperatures and privacy. If you've chosen to include sidelights on either side of your front door, you many want glass that boosts your privacy. Many homeowners choose sidelights with decorative glass–frosted glass or patterned glass will allow light into your entryway and keep peering eyes out. For a quick fix, homeowners can try decorative window film. Although this may not be as durable or as classy as decorative glass panes, this film applies easily to your entryway windows to boost their privacy. Gas-filled windows with double or triple-pane glass, which will act as an insulator, is a great option for homeowners with energy concerns. For those living in sunny, warm areas, spectrally selective glass is a great choice for keeping your home bright and sunny without it feeling like a greenhouse. Spectrally selective glass will keep your entryway cool and light. If safety is a concern, tempered glass is the perfect option. Because it crumbles, rather than shatters, it provides extra safety in the case of a storm or accident. 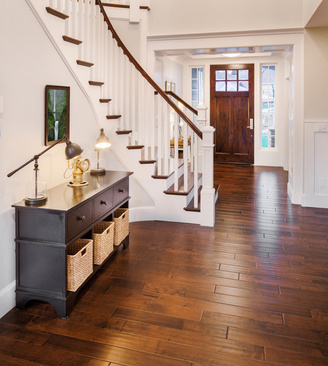 Entryway windows are a great way to make an opening statement about the rest of your home. Whether you prefer a transom or sidelights, entryway windows help to improve the appearance and elegance of the home, helping your visitors and your home's residents feel instantly at ease. Check out HomeAdvancement's database of local contractors to find the perfect entryway windows today.